[centered] OTHER WORLDS page 4 THE KELLER ANTHOLOGY -------- Jacob Hubelaire from the dread of poverty, but their happiness is marred by the absence of children. Read this novel once and you will be forced to read it again and again and each time you will find some new beauty and some new pathos in it. Ultimately the world reverts to disease, pain, crime, for no other reason than to have babies. Life everlasting of the individual is abandoned so that the stream of life can be made eternal by the death of one generation leading to the birth of a new generation. That is the REAL LIFE EVERLASTING. Weird- Fantasy is represented in the Cornwall story, THE THIRTY AND ONE, while the horror story at its best is shown in THE DEADWOMAN, THE THING IN THE CELLAR, HEREDITY and last of all in THE PIECE OF LINOLEUM. Science fiction has THE BONELESS HORROR. Perhaps one of the finest tales in this anthology is THE FACE IN THE MIRROR, a very convincing tale of a dementia praecox. This story could only have been written by a psychiatrist. This tale, printed here for the first time, is certain to attract attention and will, no doubt, be reprinted in future anthologies. The introduction by Sam Moskowitz is interesting because it is a serious attempt to explain the reason for Keller writing as he has. 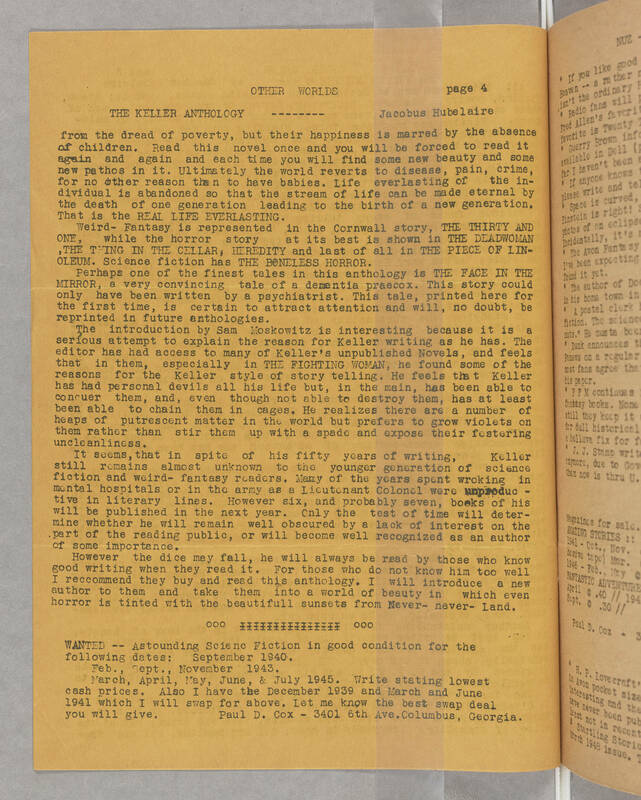 The editor has had access to many of Keller's unpublished Novels, and feels that in them, especially in THE FIGHTING WOMAN, he found some of the reasons for the Keller style of story telling. He feels that Keller has had personal devils all his life but, in the main, has been able to conquer them, and, even though not able to destroy them, has at least been able to chain them in cages. He realizes there are a number of heaps of putrescent matter in the world but prefers to grow violets on them rather than stir them up with a spade and expose their festering uncleanliness. It seems, that in spite of his fifty years of writing, Keller still remains almost unknown to the younger generation of science fiction and weird- fantasy readers. Many of the years spent wroking [sic] in mental hospitals or in the army as a Lieutenant Colonel were unproductive in literary lines. However, six, and probably seven, books of his will be published in the next year. Only the test of time will determine whether he will remain well obscured by a lack of interest on the part of the reading public, or will become well recognized as an author of some importance. However the dice may fall, he will always be read by those who know good writing when they read it. For those who do not know him too well I recommend they buy and read this anthology. I will introduce a new author to them and take them into a world of beauty in which even horror is tinted with the beautifull [sic] sunsets from Never- never- Land. [page break] ooo IIIIIIIIIII ooo WANTED -- Astounding Science Fiction in good condition for the following dates: September 1940. Feb., Sept., November 1943. March, April, May, June, & July 1945. Write stating lowest cash prices. Also I have the December 1939 and March and June 1941 which I will swap for the above. Let me know the best swap deal you will give. Paul D. Cox - 3401 6th Ave. Columbus, Georgia.